The Locker Clarifier System is designed to reduce suspended solids (S.S.) carry over to lower levels and subsequently B.O.D. 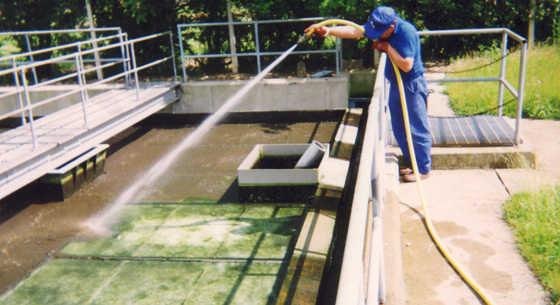 (biological oxygen demand) in the final effluent produced by sewage and waste water treatment works. Our clarifier screens are designed for use in upward flow clarifiers, radial clarifiers, endflow tanks and pyramidal tanks. 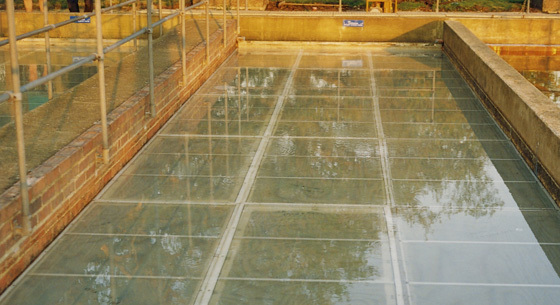 Launched in 1990 as the 'Lockertex Effluent Clarifier System', the systems consist of a unique range of polyester mesh upward flow clarifier screens with the option of automatic cleaning systems in the form of humus tank ancillary equipment. 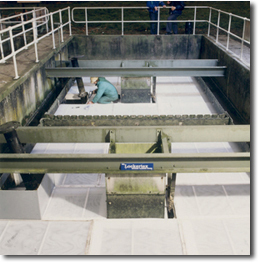 The systems have gained wide acceptance since then under the trade name of the Lockertex Clarifier System®. Installed into hundreds of final settlement tanks to reduce suspended solids carry over and 'polish' the final effluent, Locker Clarifier Systems are helping to maintain compliance at sites with consents from 15 p.p.m. S.S. up to 70 p.p.m. S.S., and are increasingly being specified for installation upstream of Sand Filters, SAF, and BAF units etc. to safeguard them from suspended solids overload. 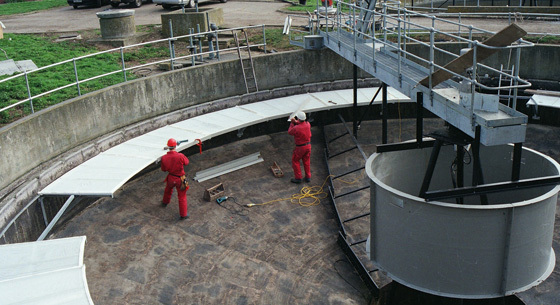 Locker Group Ltd continues to improve the product to maintain its status as a quick and cost effective method for reducing suspended solids carry over by upgrading poorly performing humus tanks, and it now has a stronger framework and humus tank ancillary equipment options such as algae wash-out sluice gates for problem sites. 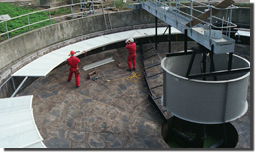 The clarifier screens are made to measure in our workshops for each tank, keeping site installation time to a minimum. The mesh screen panels are fabricated from stainless steel box section and a twin layer of U.V. stable precision woven synthetic filter mesh. They can be retrofitted into most types of final settlement tanks; horizontal end-flow tanks, pyramidal tanks, circular tanks, and even radial clarifier tanks with rotating half-bridge and scraper arms. The clarifier screens are fastened onto a rigid supporting structure of galvanised mild steel and GRP along with any baffle boards required to direct all outgoing flows up through the screens. Installation is usually between 100mm and 350mm below TWL, obstructions such as rodding pipes and valve stems are boxed out with GRP. 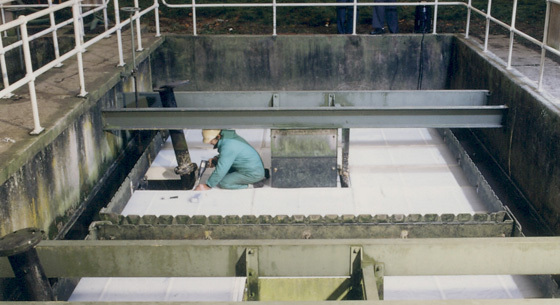 We provide a full UK installation service, and can remove old clarifier systems such as pebble beds. Locker Clarifier Screens have replaced pebble beds at many sites. The synthetic clarifier mesh is easier to clean and it is not necessary to walk on the screens, thus improving site safety. 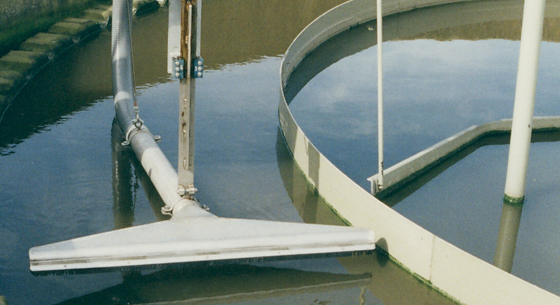 Next see information about Clarifier Operation.